Central Bank of South Africa is to issue a complete set of banknotes bearing the image of its first black president, Nelson Mandela, as a humble gesture to express country’s deep gratitude. Nelson Mandela, now 93, was released from prison on 11 February 1990 after 27 years in jail. 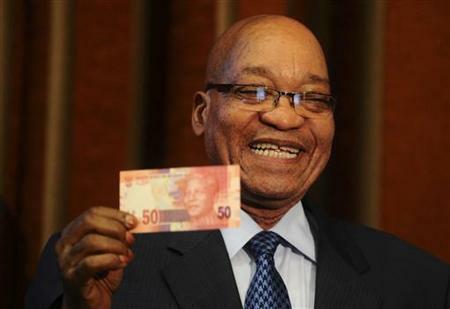 President Jacob Zuma said the banknotes were a “humble gesture” to express South Africa’s “deep gratitude”. Nelson Mandela won the Nobel Peace Prize in 1993 for his campaign against white minority rule (apartheid). He was elected president the following year. Known affectionately by his clan name “Madiba”, Nelson Mandela has now retired from public life. President Jacob Zuma said Nelson Mandela banknotes are a "humble gesture" to express South Africa's "deep gratitude"
Speaking at the central bank in Pretoria, President Jacob Zuma called Nelson Mandela’s release “the beginning of a new era of hope”. “With this humble gesture, we are expressing our deep gratitude as the South African people, to a life spent in service of the people of this country and in the cause of humanity worldwide,” President Jacob Zuma said. Advance notice of the news conference at the central bank had briefly rattled the markets, jittery about the state of South Africa’s economy. No date for the release of the new notes has yet been announced. Production has already begun, but the latest edition of the currency will only be distributed towards the end of the year.